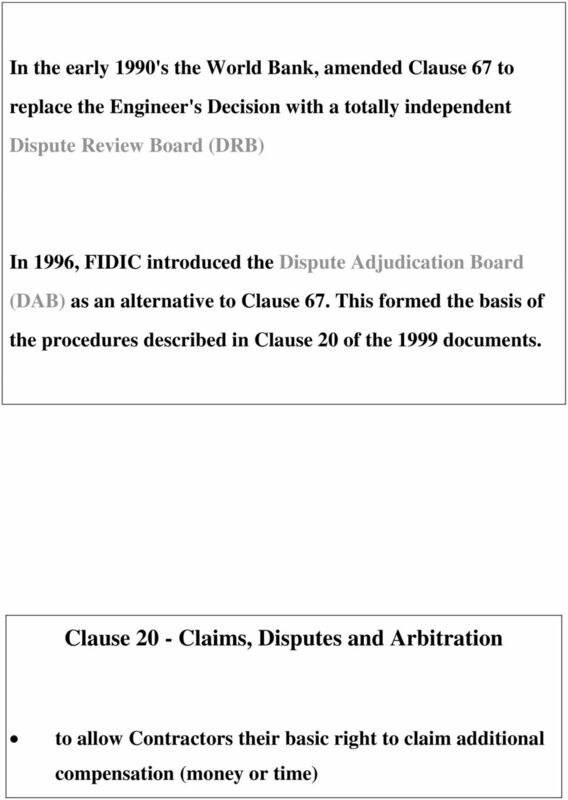 Download "CLAUSE 20, DISPUTE RESOLUTION Michael Mortimer-Hawkins FIDIC Contracts Committee"
9 become effective - i.e. when the Final Statement is issued, and when it is paid, and when the Contractor has received the Performance Security back from the Employer. 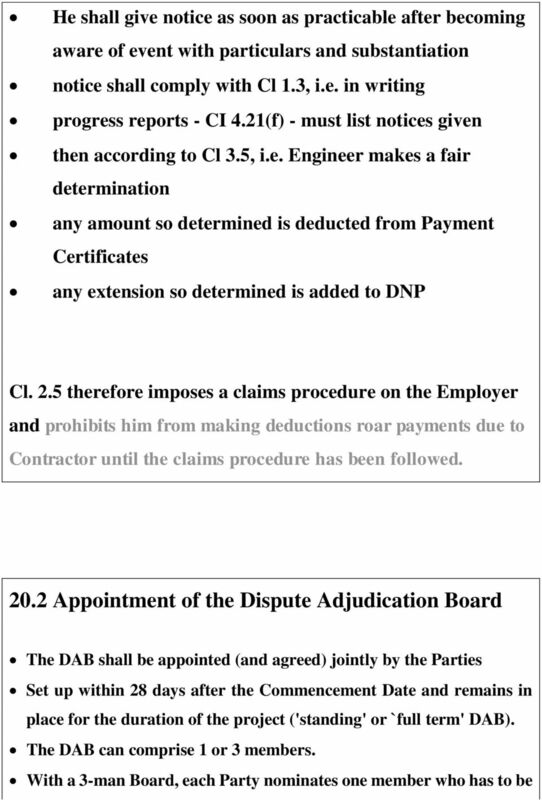 General Conditions of Dispute Adjudication Agreement Included in Book as Appendix to General Conditions, and includes Annex - Procedural Rules Form of Agreement between the Employer, the Contractor and the DAB Member Member warrants that he is impartial and independent That lie is experienced in the work, in contract interpretation and fluent Obligations set out- independent, available, etc Procedural Rules require the DAB to act fairly and impartially between Parties 20.3 Failure to Agree Dispute Adjudication Board If Parties fail to nominate a member or to agree on DAB then the `appointing entity' named in Appendix to Tender shall, at the request of either or both parties, and after consulting with them, make the necessary appointment(s). The appointing entity should be a body with the knowledge and experience to make appropriate appointments - e.g. 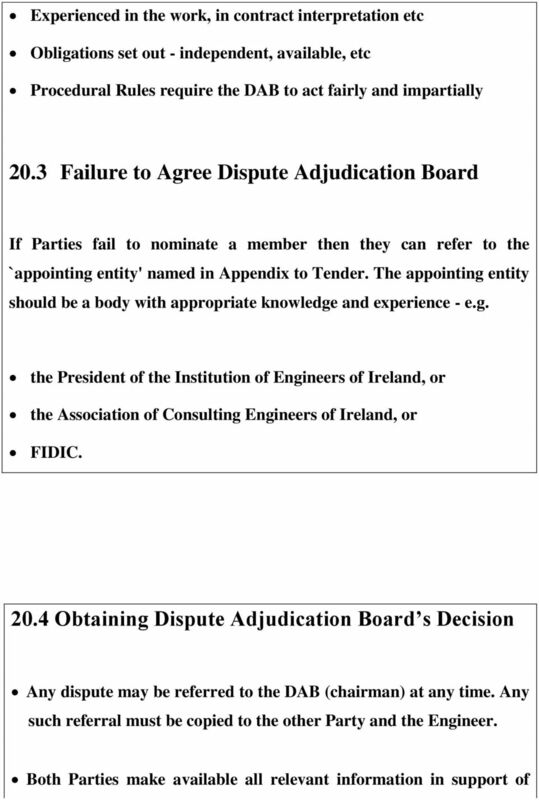 the President of the Institution of Engineers of Ireland, or the Association of Consulting Engineers of Ireland, or FIDIC. 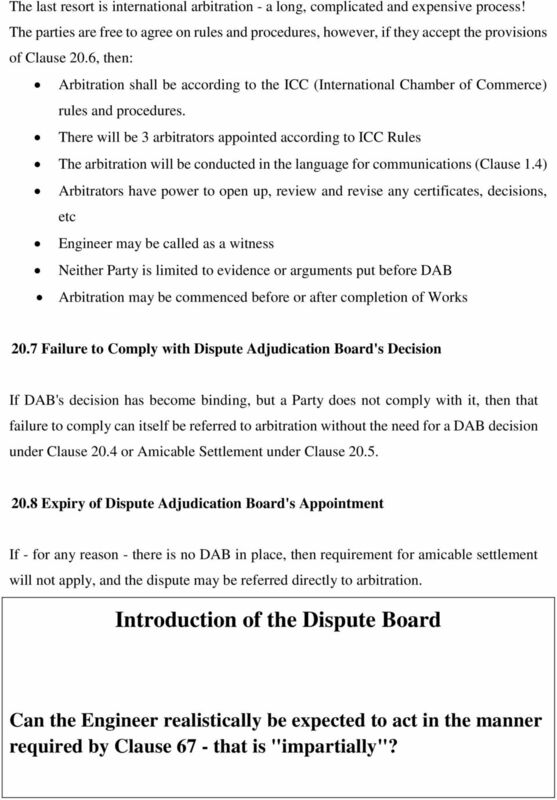 I would suggest that the chosen body is an engineering rather than a legal body Obtaining Dispute Adjudication Board's Decision Any dispute may be referred to the DAB at any time. 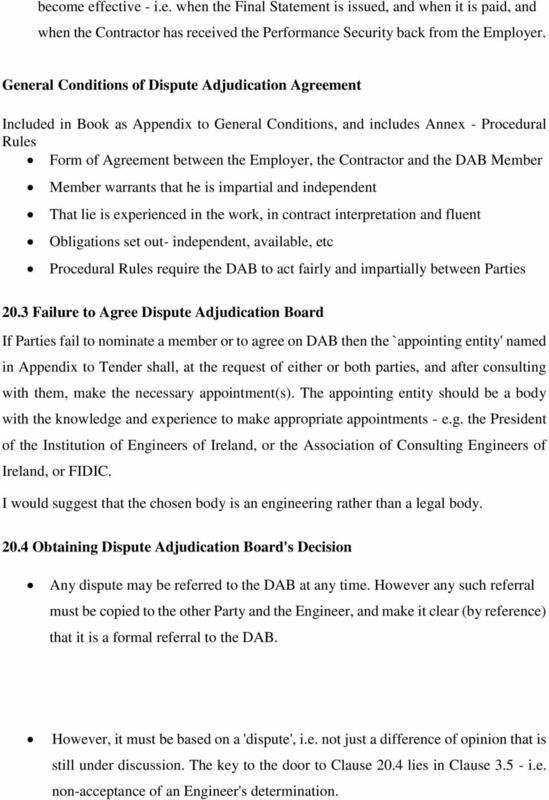 However any such referral must be copied to the other Party and the Engineer, and make it clear (by reference) that it is a formal referral to the DAB. However, it must be based on a 'dispute', i.e. not just a difference of opinion that is still under discussion. The key to the door to Clause 20.4 lies in Clause i.e. 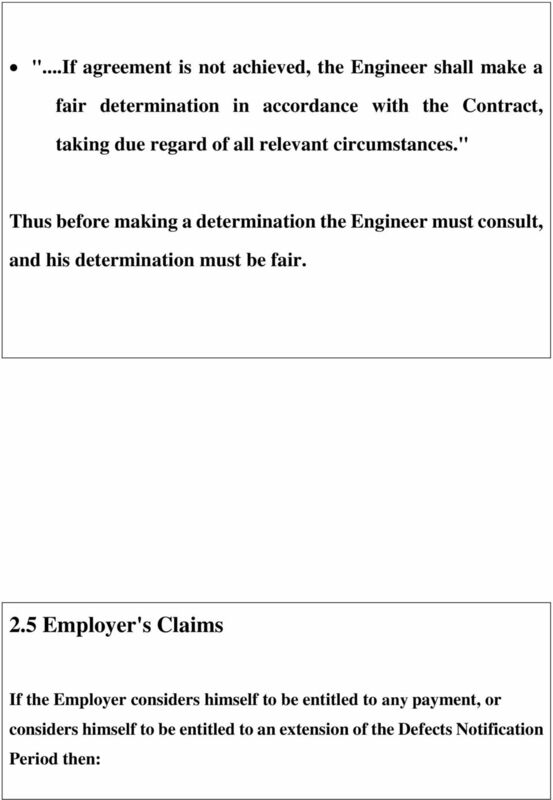 non-acceptance of an Engineer's determination. 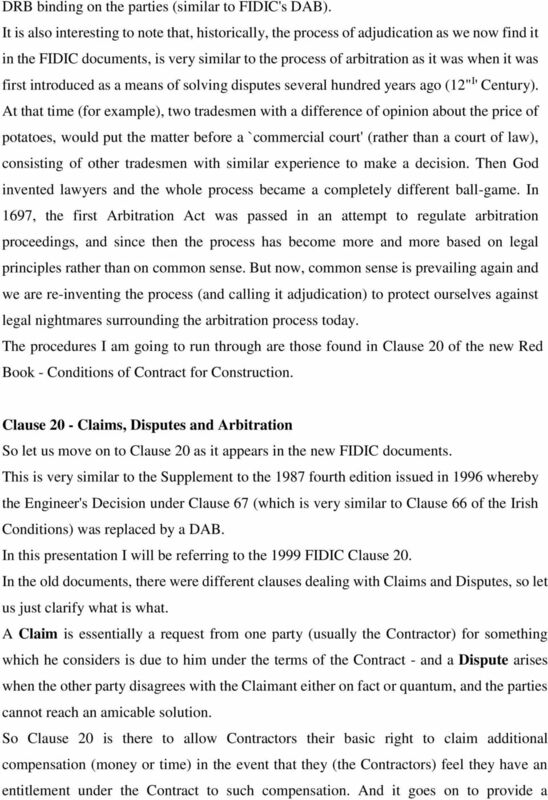 11 The last resort is international arbitration - a long, complicated and expensive process! The parties are free to agree on rules and procedures, however, if they accept the provisions of Clause 20.6, then: Arbitration shall be according to the ICC (International Chamber of Commerce) rules and procedures. 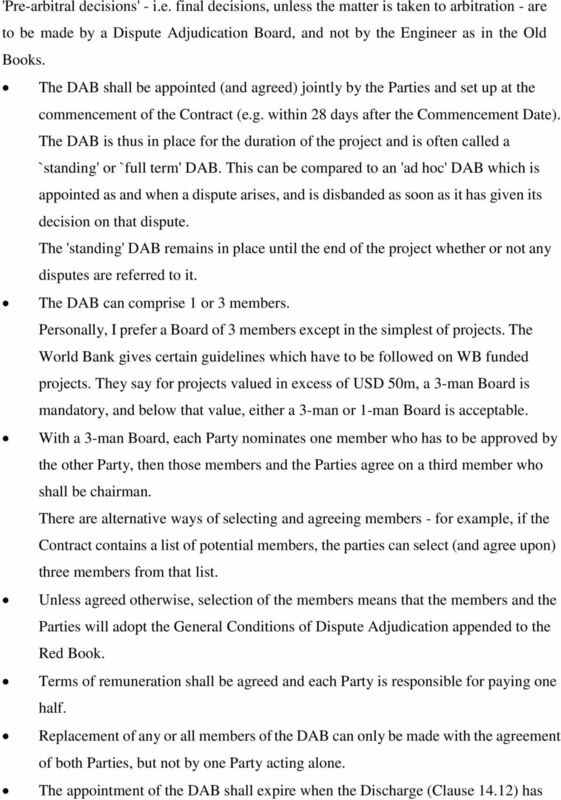 There will be 3 arbitrators appointed according to ICC Rules The arbitration will be conducted in the language for communications (Clause 1.4) Arbitrators have power to open up, review and revise any certificates, decisions, etc Engineer may be called as a witness Neither Party is limited to evidence or arguments put before DAB Arbitration may be commenced before or after completion of Works 20.7 Failure to Comply with Dispute Adjudication Board's Decision If DAB's decision has become binding, but a Party does not comply with it, then that failure to comply can itself be referred to arbitration without the need for a DAB decision under Clause 20.4 or Amicable Settlement under Clause Expiry of Dispute Adjudication Board's Appointment If - for any reason - there is no DAB in place, then requirement for amicable settlement will not apply, and the dispute may be referred directly to arbitration. 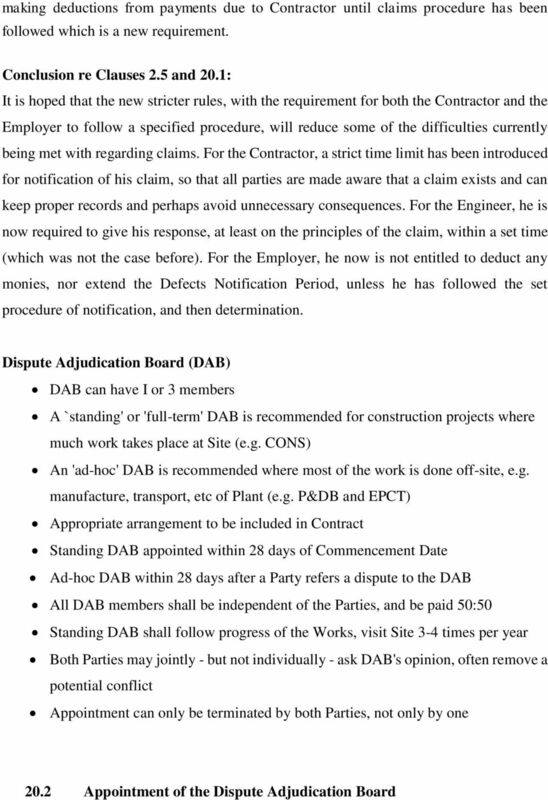 Introduction of the Dispute Board Can the Engineer realistically be expected to act in the manner required by Clause 67 - that is "impartially"? 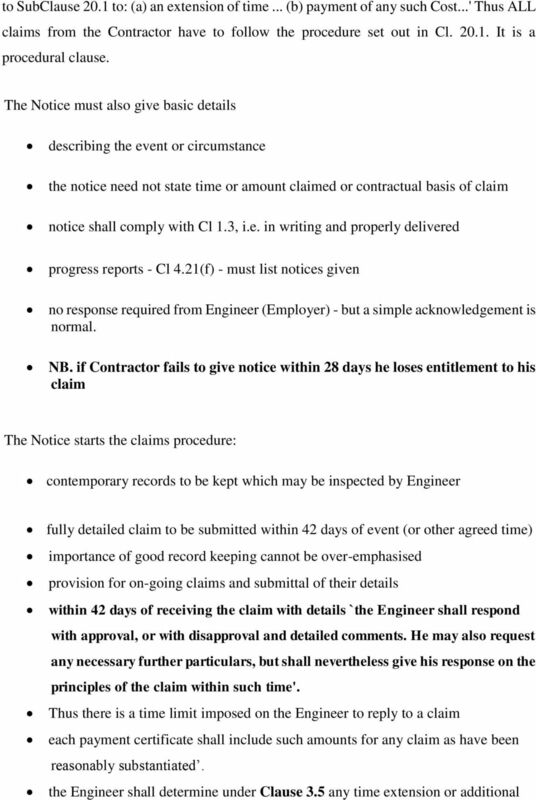 15 entitlement to his claim The Notice starts the claims procedure: contemporary records to be kept fully detailed claim to be submitted within 42 days provision for on-going claims within 42 days of receiving the claim with details `the Engineer shall respond with approval, or disapproval. 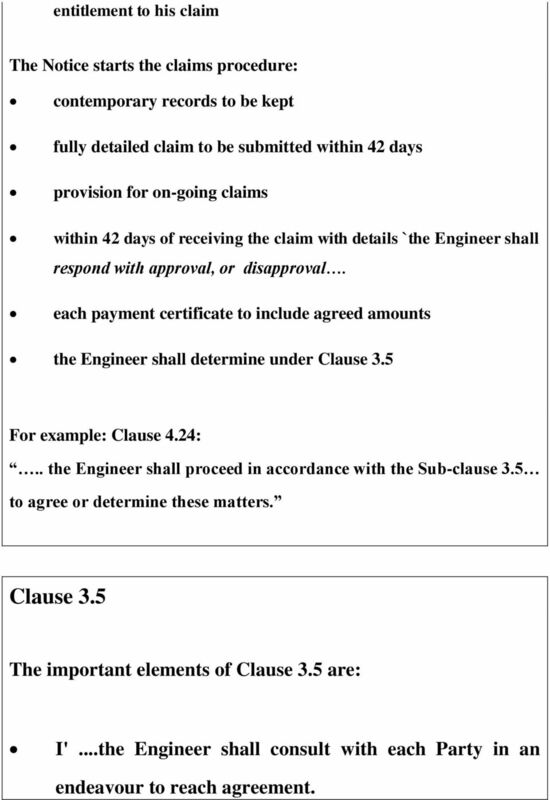 each payment certificate to include agreed amounts the Engineer shall determine under Clause 3.5 For example: Clause 4.24:.. the Engineer shall proceed in accordance with the Sub-clause 3.5 to agree or determine these matters. 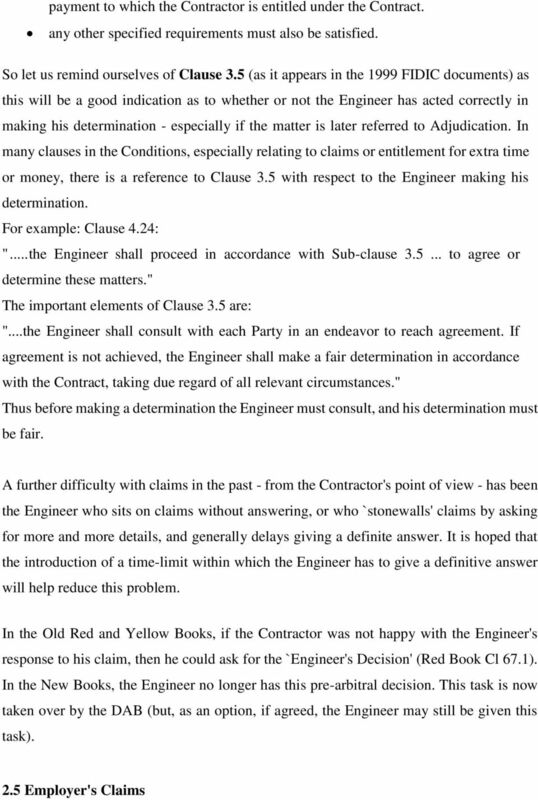 Clause 3.5 The important elements of Clause 3.5 are: I'...the Engineer shall consult with each Party in an endeavour to reach agreement. 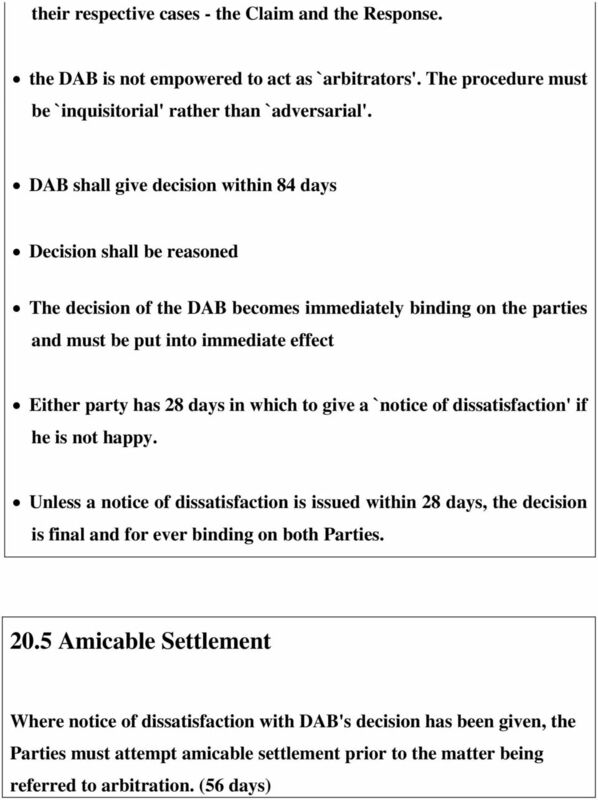 22 comply with it, then that failure to comply can itself be referred to arbitration without the need for a DAB decision under Clause 20.4 or Amicable Settlement under Clause Expiry of Dispute Adjudication Board's Appointment If - for any reason - there is no DAB in place, then requirement for amicable settlement will not apply, and the dispute may be referred directly to arbitration. 594 Yearbook of the United Nations Commission on International Trade Law, 2000, vol. XXXI B. 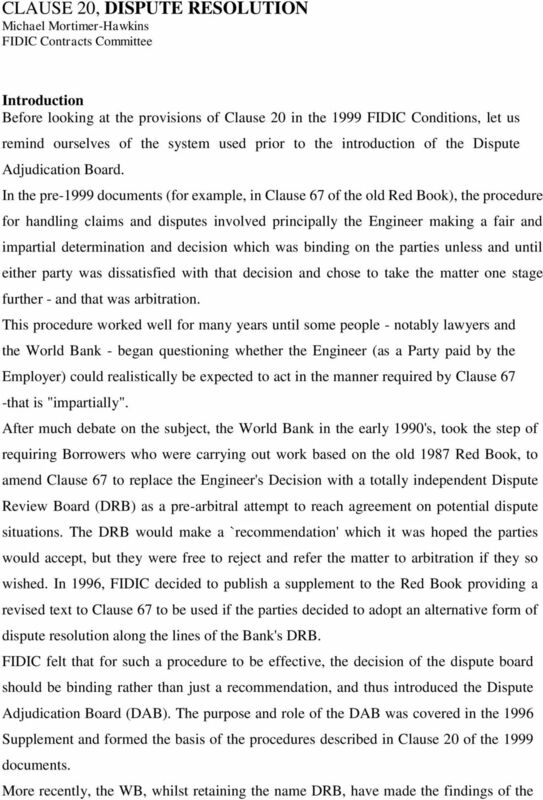 Uniform Rules for Contract Bonds (URCB): Report of the Secretary-General (A/CN.9/478) [Original: English] 1. TEMPLATE AGREEMENT FOR THE SALE OF AN EXISTING NEW OR SECOND HAND STOCK BOAT. 1. [ ] a limited company incorporated in England & Wales(Reg.no. 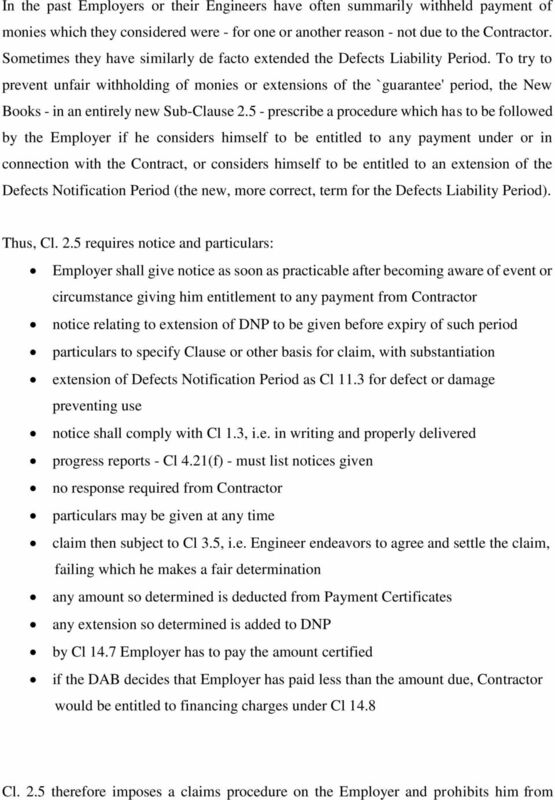 1.1 These Rules for Dispute Resolution apply to all disputes referred to under articles I-12 and I- 13 of the Rules. 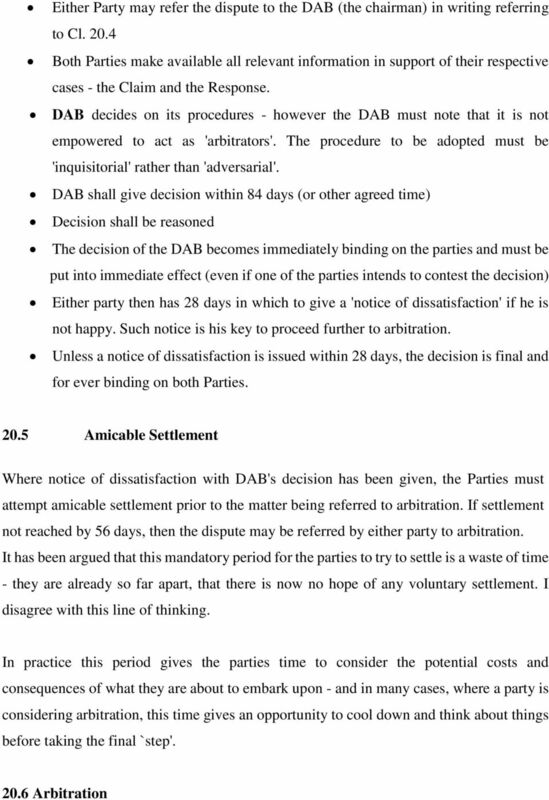 Page 1 (25) 4) SVEA COURT OF APPEAL JUDGMENT Case No. Department 02 4 May 2009 T 980-06 Division 0204 Stockholm CLAIMANT State Oil Company of the Republic of Azerbaijan (SOCAR) Counsel: Advokaten M P.O. 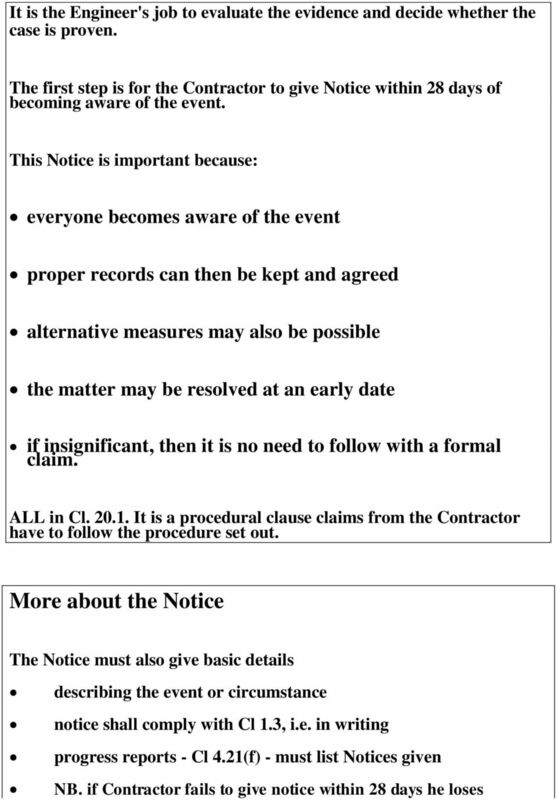 Chartered Architectural Technologists: Client information for domestic projects 1 Contents Section 0. (Pg. 1) Section 1. (Pg. 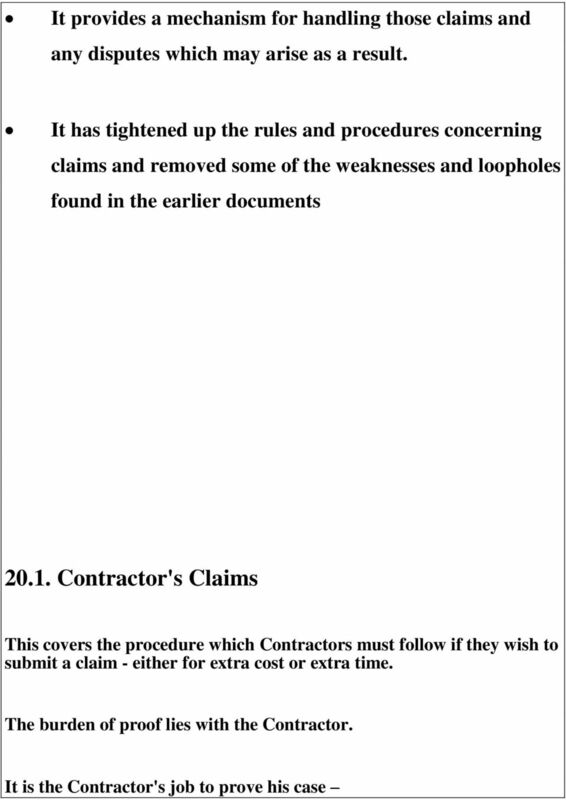 2) Section 2. (Pg. 3) Section 3. (Pg. 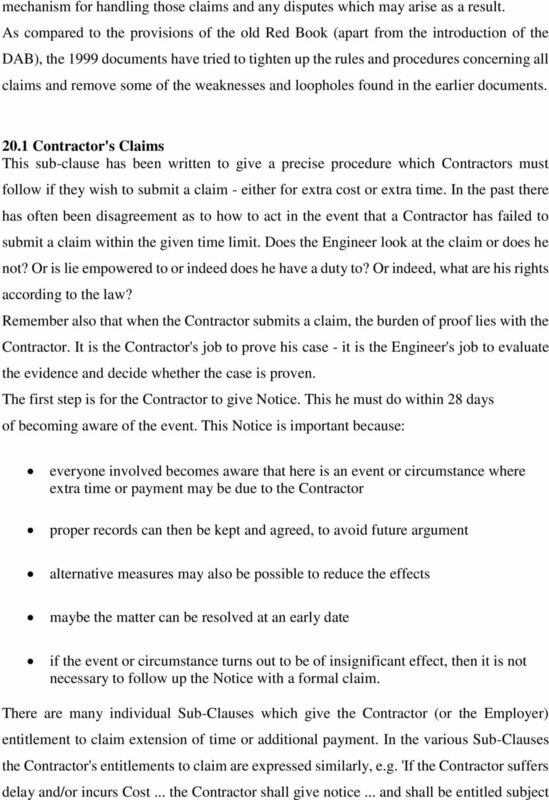 5) Section 4. (Pg. 9) Section 5. (Pg. IKM-I-K-01E Standard conditions of purchase IKM Gruppen Side 1 av 6 Løvås Svein Firma/Company: IKM Gruppen AS 1. GENERAL 1.1 These conditions of purchase shall apply unless otherwise agreed in writing.